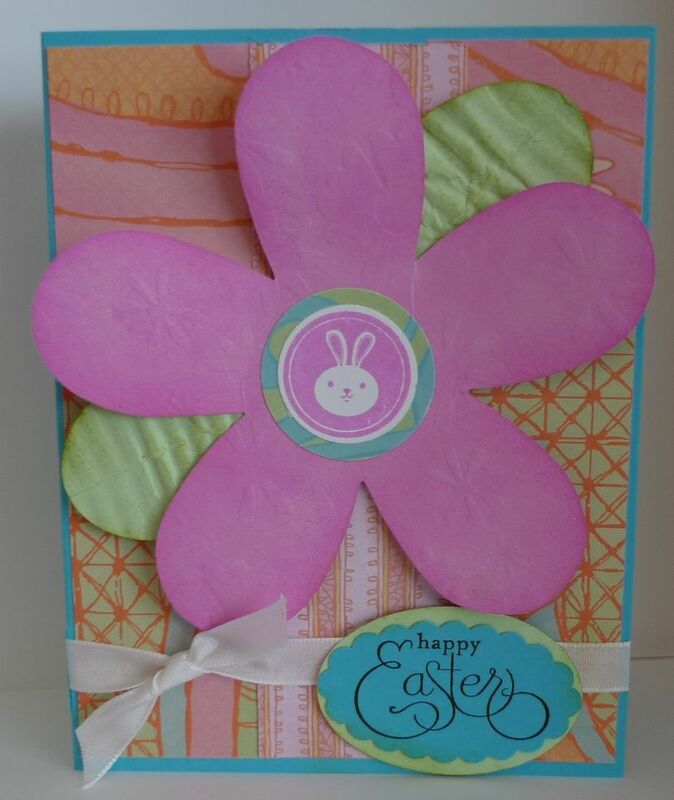 Karina's Kreations: Eggcoutrements Easter Card! Isn't this a cheerful card? The Designer paper is called Kaleidoscope and uses very bright and beautiful colors. I designed this card around the flower. I've been wanting to use the Stampin' Up Bigz Clear Flower die for awhile now and thought it would be perfect for an Easter card. The flower was made with Pixie Pink card stock, the Bigz Clear Flower die and the Big Shot Die Cut machine. I added some texture to the flower with the flower texture plate from the Texture Plates #4 set. I sponged the flower with Pixie Pink ink to make it stand out. The flower petal leaves were made with Gable Green card stock, the Wide Oval punch and the Paper Crimper Tool. I stamped the bunny from the Stampin'Up Eggcoutrements stamp set in Pixie Pink on Whisper White card stock and punched it out with the 1" circle punch. I layered it on Kaleidoscope Designer Series paper that was punched out with the 1-1/4" circle punch and added it to the center of the flower. Happy Easter is from the Well Scripted stamp set. It was stamped on Tempting Turquoise card stock in Basic Black ink and punched out with the Scallop Oval punch. It was layered on to Gable Green card stock that was punched out with the Wide Oval Punch. The greeting was placed over Whisper White Taffeta Ribbon.